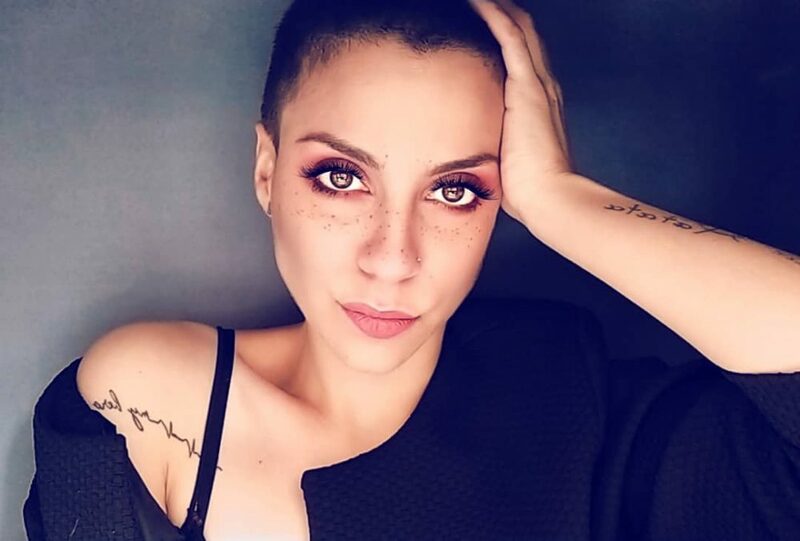 Short hair is great to have. It is easy to maintain, effortless if you want it to be, but can also be glammed up if you’re into type that of thing. 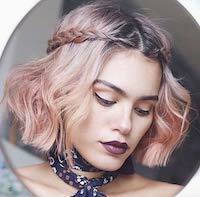 Sometimes the same simple lob or pixie cut can get boring though, so why not amp up your style by adding in some braids. That’s right, you don’t have to have long flowing hair to rock an awesome braided look. These looks can go from really simple, to something amazing and Instagram worthy that all your friends will bu buzzing about. In the end braids are fun, decorative, and super functional so we can see why you would want to incorporate one into your hairstyle ASAP. Take a look at our 30 favorite braid styles you can wear with short hair. 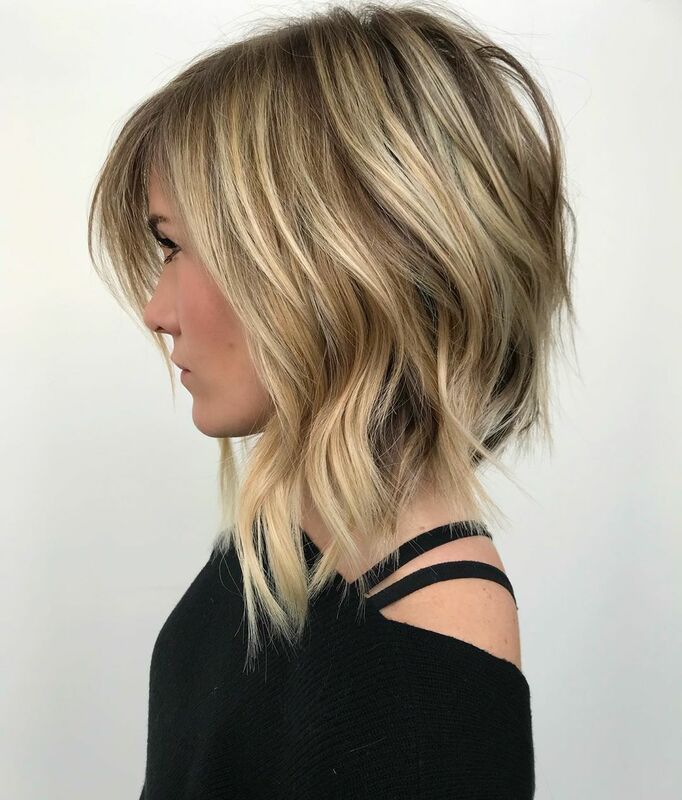 This style looks great on almost anyone and is perfect to wear if you have a nice lob. The braid starts off as a french braid and then you tease your ends so they stick out a bit. You can use a little hairspray to help hold everything in place but part of the look is to have that messy feel. Leave a little bit of hair out around your ears and curl it forward to keep that messy feel going. Secure the ends of your braids with some clear pony tails, and your look is complete. 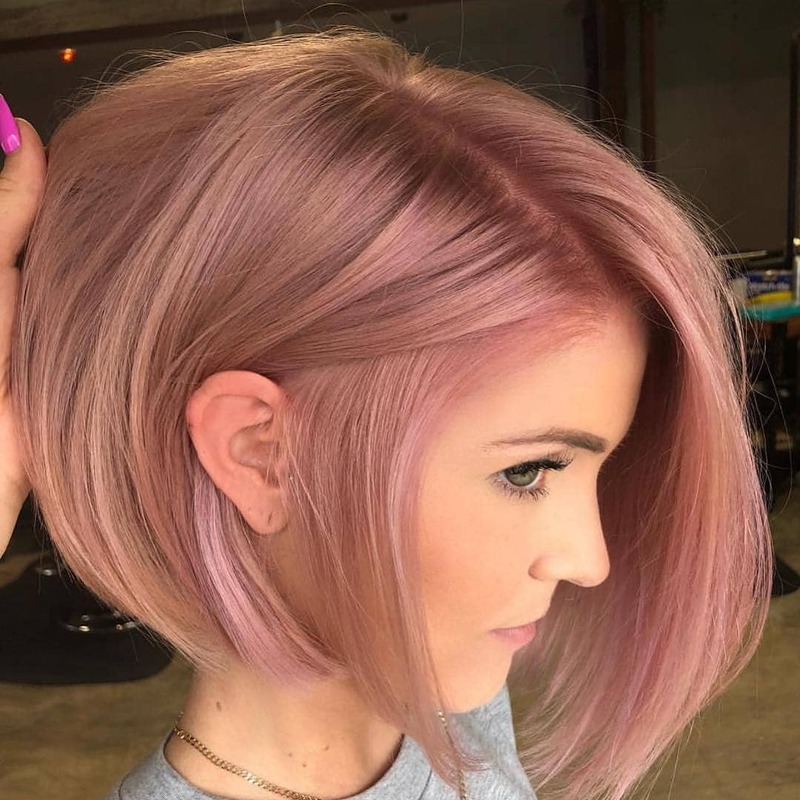 Yes, even if you have a Bob you can still wear some beautiful looking braids that also give you an edgy flair. Get the same look by parting your hair off to the side and weave a braid off to one side and pin it down. Depending on how you are feeling depends on how many braids you can have, do just one or three, it doesn’t matter. Spray some setting spray to keep everything in place and run a flat iron through the rest of your hair to keep it straight. 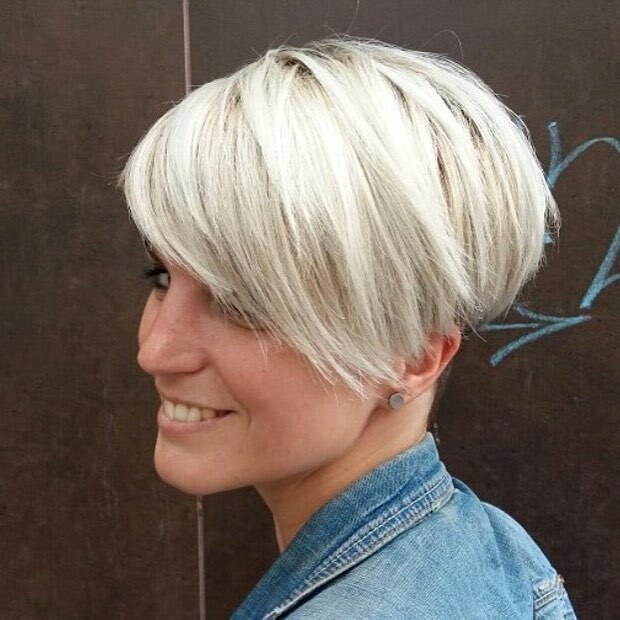 This is a great style to keep your hair out of your face but still look stylish. 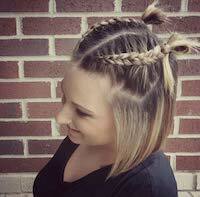 The dutch braid is a really cute style and will draw a lot of attention to your hairstyle. 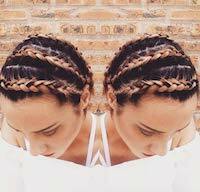 Wear this dutch braid off to the side of your hair to help keep your hair away from your face but still looking cute. Part your hair to one side and then begin to braid the long side. Start from the fron and work your way to the back until you are out of hair. Secure with a small elastic band and pin under the rest of your hair to hide the end of the braid. Curl the rest of your hair to give a glam feel and you are finished. This braided style is so gorgeous and all your friends will be asking how you achieved it. The braid circles around the back of your head giving you both glam but efficiently when you wear it. Start off on one side and braid you hair all the way around, with each loop make sure to pull a piece of your hair through so it falls through the braid like, starting at the top and coming out the bottom. Continue to braid your hair until you have completely circled your head and then secure with an elastic band and hold with a pin. You can either curl the ends of your hair or wear it straight. 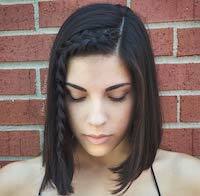 This braid works great if you have a Bob haircut and looks awesome on any hairstyle. Grab the front section of your hair and even part it on both sides, think like you are starting a pony tail out. Weave the front section that your grabbed into a french braid and then secure with a hair tie. You can either put the rest of that section of hair into a bun or leave it in a pony tail. Let the rest of your hair stay down and enjoy your simple style. 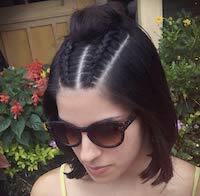 This is a classic braided look that may seem childish but really works with anyone. Split your hair down the middle and start braiding each section. The type of braid depends of you, you can do cornrows, french, or a mermaid, whatever you like. Stop braiding about halfway down and secure the rest of your hair with a hair tie. Brush out the rest of your hair for a messy feel and spray with some hairspray to keep everything in place. This look is super effortless and looks amazing, plus when you take the braids out you can weep the benefits of curly hair. If you love working out but your tired of the same old hairstyle, we have something for you. Section your hair into four parts, two parts on top and two on the sides. French braid each of the sections until you reached the crown of your head. Secure each section with a small elastic band and then gather your hair and pull it into a ponytail. And that’s it! You have an amazing hairstyle for the gym that looks great but also keeps your hair off your face and neck. 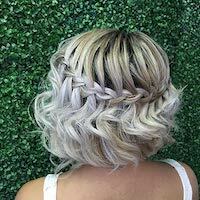 Pixie lovers rejoice because even you can wear a gorgeous braid. 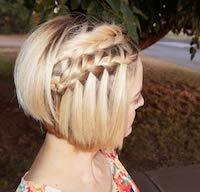 If your pixie is longer on top, then this braid is really made for you. Take some hair from the front of your head and start braiding it down towards your ear, this doesn’t have to be a fancy braid, just a simple one. Keep braiding your hair until you reach behind your ear and secure it with a pin. Let sections of hair stick out from the braid to give an edgy look and then tousle the rest of your hair to give it a similar look. There you have it, an awesome braided twist on a simple pixie cut. 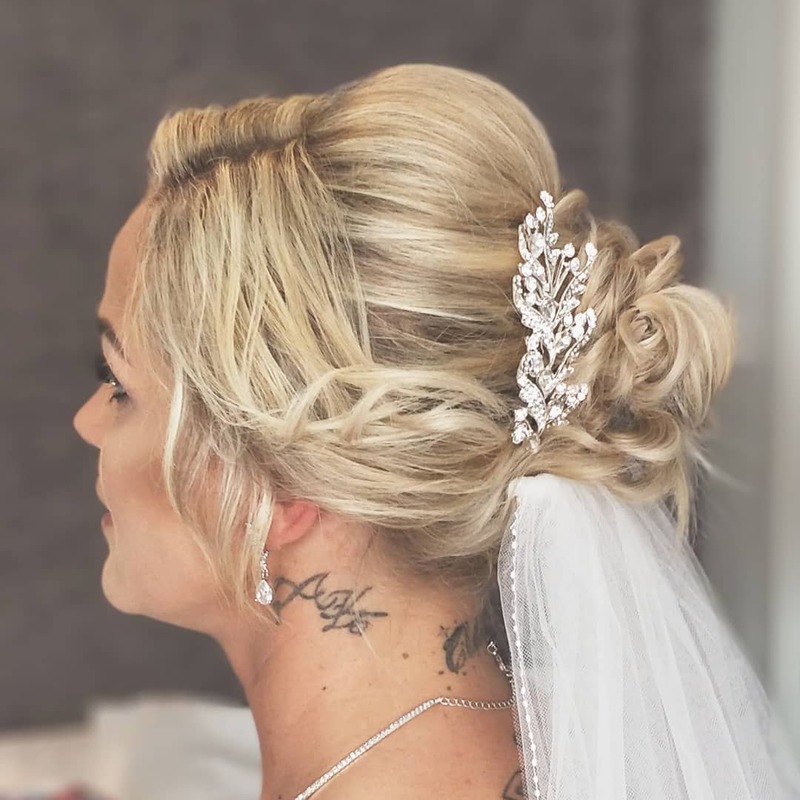 The twisted crown is a braid that we have been seeing a lot lately and we see why. The braid is simple to achieve but super cute and effective. Start off by taking a section of hair from each side of your face. Starting from the top, braid your hair down and around your head in a french braid style, grabbing additional strands are you braid. Secure the braids tat the back of your head with a small elastic band and finish off with some hairspray to keep it all in place. If you aren’t sure if you like braids or want to wear one, then start off with a simple side braid. Take a small section of hair front the front of your hair and braid it back towards your ear. The braid is nothing special, just your classic braid. Secure the braid behind another strand of hair with a pin and that is all there is to it. You can wear the rest of your hair pencil straight or wavy, either way will look adorable with this braid. 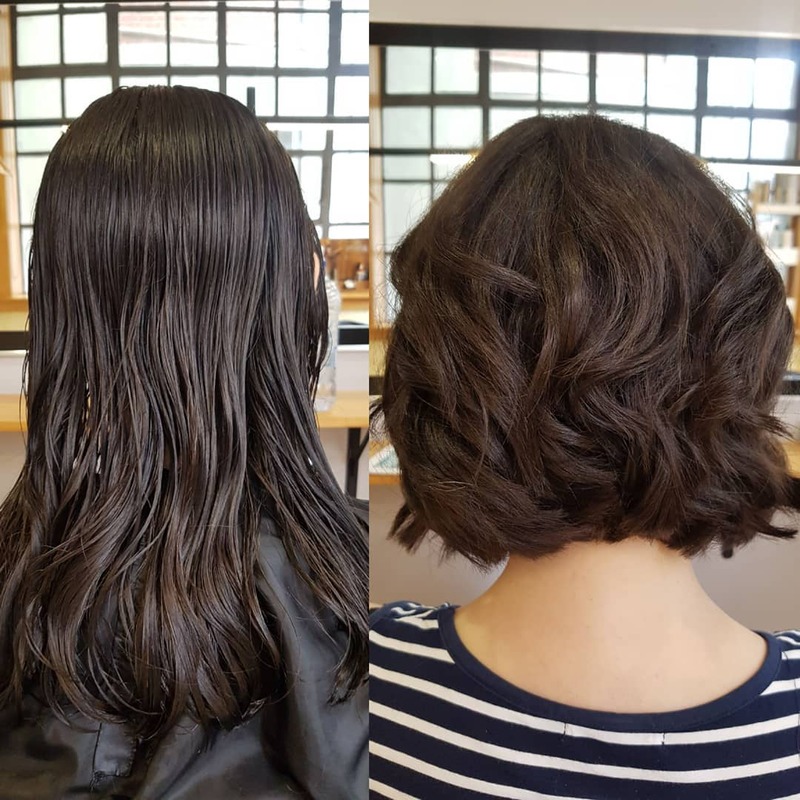 Regardless if you have a lob or a Bob, this loop braid is perfect for everyone. Although it is a little hard to achieve, the payout is worth it. Part your hair to the side and start the loop braid out on the side that is parted. Work the braid from the side, to the front of your head, working towards the other side and behind your ear. Once the braid is complete, secure it with a elastic band and pin it behind your ear and let some of your hair fall over it a bit.. 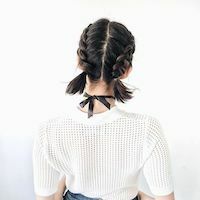 This dutch braid looks beautiful on any short hairstyle and doesn’t take a lot of time to do. Pull your hair towards the back of your head so it all meets and begin your braid. Let some strands hang out if they want to, it’s okay if it looks a little messy. Once you run out of hair, secure the braid at the nape of your neck and you’re finished. 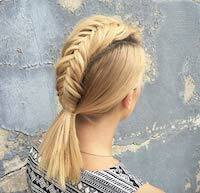 It’s a great braid to get all your hair out of your face but still look great while doing so. Can’t decide on what braid to wear, then do both. 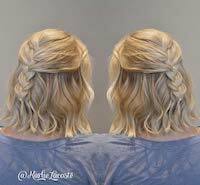 This waterfall and fishtail combo look awesome and works perfectly on short hair. Start out towards the top of your head with a fishtail braid and braid it towards the back of your head. Secure it with a band and begin working on your second braid. Create a waterfall braid right under your fishtail, letting strands fall through it as you create it. Secure the second braid and pin them both behind the back of your hair. Wear your hair straight or curly, it will look great with both. 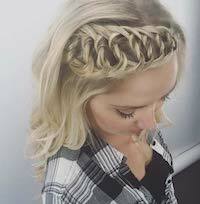 This soft braid can look elegant and beautiful and isn’t horrible to achieve. Curl your hair to give yourself an even more elegant look and grab a top section of hair to braid. Create a classic braid that isn’t too tight and braid it towards the back of your head. Secure it behind some hair with a pin and you’re finished. 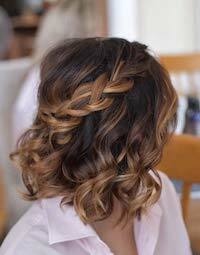 This braid is super easy to achieve and looks great with short, wavy hair. 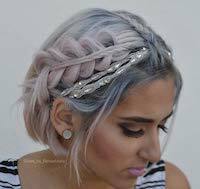 The dutch braid makes another beautiful appearance and this one looks great. 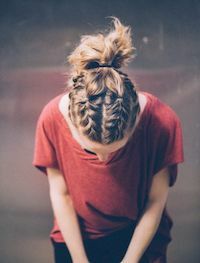 Pull a small section of your hair back and braid it into a dutch braid, ending it at the middle of the back of your head. 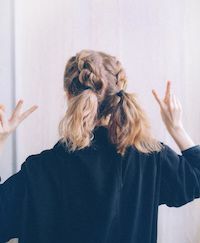 Take two strands from either side of your head and twist them around a few times, then use an elastic band to tie all three pieces together at the back of your head. 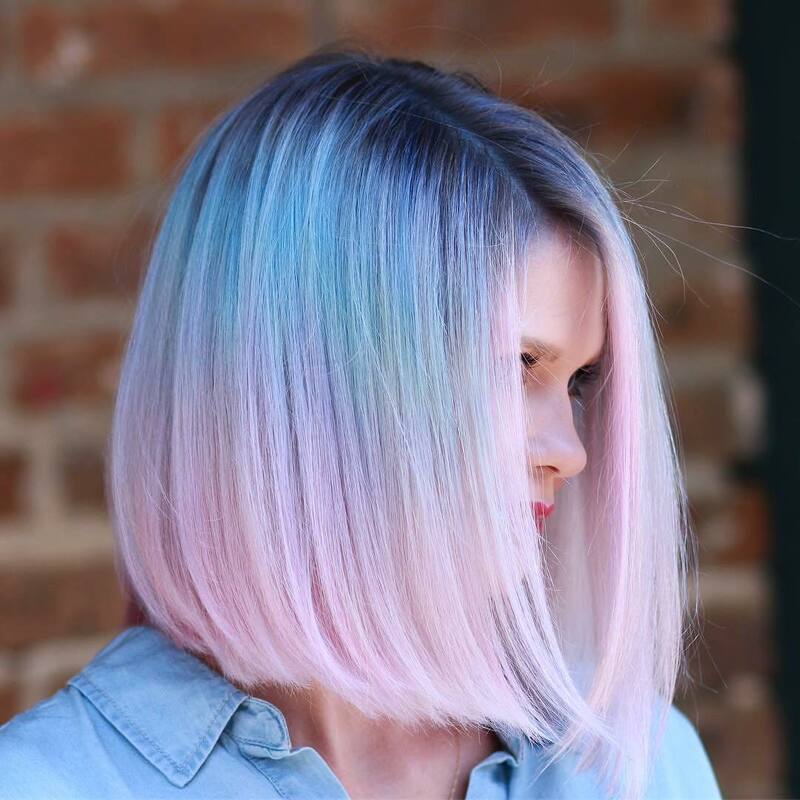 Wear the rest of your hair straight and enjoy this amazing look. If you are rocking a lob or a bob, then you can totally wear a headband braid and amp up your hairstyle a little. Start from one side of your head and french braid your hair straight across, essentially creating a headband out of your hair. When you have reached the other sider secure your hair with a pin and you’re done. You can wear your hair both wavy or straight with this look, it’s going to look amazing regardless. 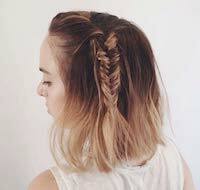 If you decided to cut your hair into a pixie cut but kept the top a little long then you can totally braid that into a bubble braid. 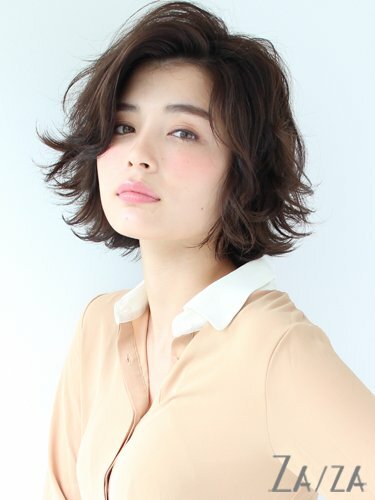 Pull all your hair onto the top of your head and section it into four parts. Tie little sections of your hair down the middle, creating little bubbles with each section. Continue to do this until you have no hair left and you’re finished. A really simple braid to get your hair out of your face but still have an awesome hairstyle. 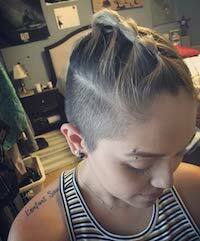 Top knots are popular today and even with short hair you can still rock one yourself. Add in a few cool braids and you will really elevate your top knot to the next level. Start by sectioning off part of your hair in the front. Add in two small cornrow braids on either side, keeping them close to the head and tight. Finish off by securing the rest of that section into a bun and pinning it in place. The rest of your hair can be worn straight or wavy and you will be in style. 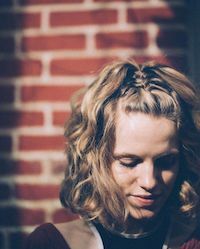 This braid is cute and easy to obtain if you have a bob, lob, or a long pixie. Part your hair to one side and begin your braid where your part starts. French braid your way across the front of your head, towards your hairline, and wrap it around too the other side by your ear. Take another section of hair above your first braid and do a second french braid, matching your original braid. Secure your braid with a pin and your look is complete. Get your hair out of your face with this braid and still look cute while doing so. Part your hair down the middle then french braid both sides towards the back. 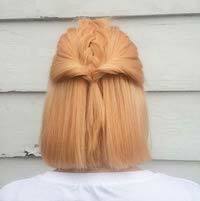 When you reach the crown of your head, secure the braid with an elastic tie but don’t pull all the hair through. 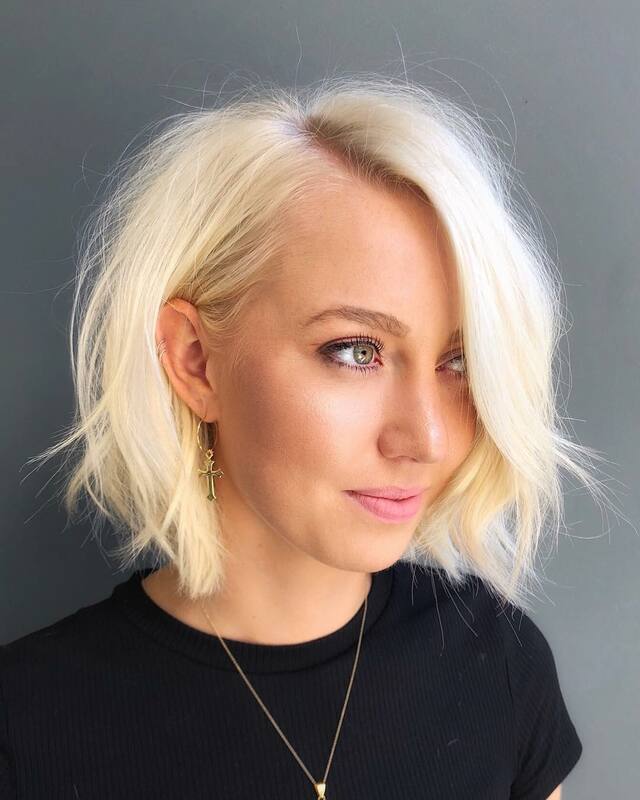 This look is cute, fun, and functional and you can wear the rest of your hair straight or curly. This braid will wow all your friends and be a show stopper the minute you step out of your house. Start by creating a dutch braid on one side of your head, makes sure to leave a little piece of hair out to make a different braid. Weave the dutch braid until you reach your ear and pin it back. Create a fishtail braid with the small section of hair you left out and lay it across the top of your dutch braid and secure it with the dutch braid behind your ear. Finish off by adding another small fishtail braid down the center of your head. This braid is almost as classic as the original fishtail braid and looks awesome. Sweep the front of your hair back and braid it into a fishtail braid, finishing it off onto one side. Secure it with a clear elastic band and fan the edges of the braid out to truly look like a fishtail, hence the name. Use a little texture spray in your hair and tousle it around and your braid is finished. This braid is super edgy and works perfectly with a lob or bob hairstyle. Create a fishtail braid going from the front of your head towards the back. 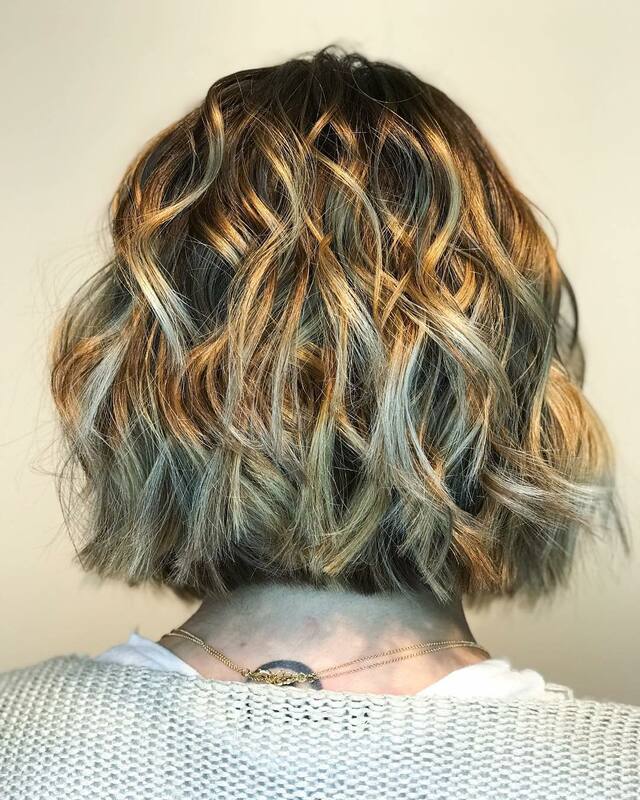 Tease your hair at first to really get the volume you are looking for to achieve your mohawk and then create your fishtail similar to a french braid by pulling pieces from the side. Weave your braid from the top of your head all the way down to the back and secure with a elastic band. Set the whole thing with a little hairspray and you are done. 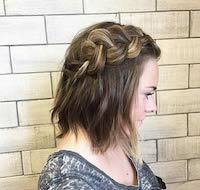 This braid may look complicated to do but it is really simple and works perfectly with short hair. Grab a section of hair in front of your head and braid two piece together in a big, chunky style. Wrap the braid around to the back of your head and secure it with a few pins and that is all you need to do to have an amazing look. Put a little bit of a twist on your classic french braid by not braiding all your hair into it. Section your hair so you can braid half of it and french braid it from the top of your head, all the way down. This braid doesn’t need to be super tight or nice, a little messy feel really works well with it. Secure the end with a clear elastic tie and your look is good to go. Wear your hair curly for a nice going out look that will perfectly frame the front of your hair. If you’re looking for just a little something to make your hairstyle pop, then go for this double fishtail braid. Take two sections towards the middle of your head and create two fishtail braids. The braids don’t need to long or perfect, just something small that will catch the eye. Pin them under a little bit of hair and that is all you need to do to make a stylish but simple look. These braids look amazing with short hair and are perfect for the summer time when it is too hot to weave your hair down. Section your hair into five parts and then weave large cornrows on each part. You should have three braids on top your head and two in the back. It’s okay if some strands are sticking out, this braid does not need to be perfect. Finish the look off with some hairspray and you are good to go. If you aren’t a braid expert, then this braid is for you. Take two small strands from the front of your hair and create a classic braid. Wrap the braid around either side of your head and secure it in the back with an elastic band. That’s it, this braid is simple to do but looks awesome. 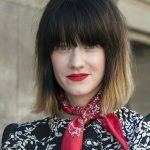 Wear the rest of your hair wavy or straight and it will look fabulous. The side part braid is easy to do and perfect if you’re short on time. Part your hair to the side and then create a french braid on the side of your art that has more hair. French braid until you get near your temple and then continue braiding your hair like normal. Secure the end with a elastic tie and your hair is finished. Perfect for an on the go look that doesn’t take a lot of time. Boxer braids really have been making a scene this year and they are cute to wear. Dress up a look with your braids or wear them for an easy workout hairstyle. Part your hair down the middle and french braid your hair from the front all the way to the back on both sides. Secure your hair with a band at the nape of your neck and spray from hairspray to catch any loose hair. Braids are a great look to wear to almost anywhere. They can easy going and fun or you can really dress them up and make a statement with your hairstyle. 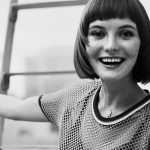 Regardless of how long your hair it, we really encourage you to try one of these awesome short hairstyle braids yourself and see just how easy and fun they are to do. We promise you’re going to love your look no matter what.